The simple meaning of Dalet can be conveyed to us in three ways. Dalet is cognate with the word delet, which means 'door'. Dalet can also be read as dalat, which means 'poor'. Finally, Dalet also represents dilisoni, which is translated as 'to lift me up'. If there is one thing that Dalet has conveyed to me on a personal level, it is the characteristic of humility. I have found that the three simple meanings above, convey this concept in a beautiful manner. To study this we must always remember that function communicates a wealth of living information. To be poor is not to be without means, but rather, we can see this as a function of requiring provision that is currently beyond our means. This is an extremely important concept in Torah. Without Hashem, we are in fact impoverished and it is only through the humility of understanding this, that we come in to the wealth of His provision. A provision that is supplied because His Mercy and Compassion are One. Furthermore we realise that our means, can never out grow His provision, so in light of this reality, we are always poor. We can take this process even further when we realise the function of the door. The door does not allow provision to flow through it for its own gain. The door simply is. To be a door for the glory of His Name, now that is something. Yet the door cannot boast of this fact. This is a truly humbling concept to ponder on. What is even more amazing is that this is the very blueprint of our nature as a reflection of Him. 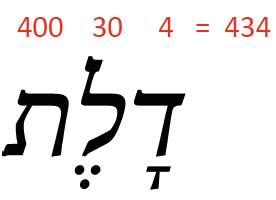 For we are after all ADaM (Aleph Dalet Mem). Finally, we come to dilisoni, a truly marvelous word. King David, who is in my opinion one if the greatest champions of humility in Tanach, penned these words. "I will praise you; For you have lifted me up" (Psalm 30:1) King David knew that praise is a condition of perspective. The only way to perceive Hashem is when He lifts us up.